Do your students need help developing the body section of a narrative essay? This post provides ideas for creating a strong body using the power of 3. It is an effective approach to building up the body of a story. These ideas are ideal for any writing curriculum and are a part of a series of mini lessons for writer’s workshop designed for scaffolding through the writing process. There are several steps to teaching the body of a narrative essay. It is important to keep the events in sequential order. Explain that this is the middle of the story where characters are developed and events show a heightened suspense and climax. It needs to unfold naturally. This is a great place to bring out the hamburger model to remind them that it is the “meat” of the story! I like to explain the reason of using THE POWER OF 3- three fantabulous events to reveal that will tell the complete story. It is the perfect number of events for your story. It is more effective than its neighbors. Two doesn’t seem to be enough and four seems to be too much! An organized essay has 5 paragraphs. An introduction, 3 body paragraphs, and a conclusion. It is the perfect amount of information and detail. Each body paragraph should follow the paragraph model of topic sentences, relevant details, and closing sentence. The next lesson on suspense and climax should also be taught at this time so students can include it in the body of their papers. Take the story you are working on as a class and model writing ideas for the body of the story. Talk out loud as you brainstorm and have students chime in. Discuss the plot from the previous lesson and how you can develop the plot in 3 events. Together, write a topic sentence for each event and provide 3 vivid details that can later be developed. Then show students how to add the body to a graphic organizer. Have students take notes on the body using the teaching notes above so they have a reference next time they are developing a narrative story. If your time is limited, make a copy of an anchor chart or the notes you want them to remember and hand it out to your students to keep in a notebook. This is an example of an interactive notebook page for notes. If you don’t have my interactive writing notebooks, you can have your students draw a muscle and write in the notes. If students need practice or you would like to reinforce this lesson, provide prompts for the students to write 3 events for each and share them with the class. Here are some samples below. Students should now apply what they learned to their own on-going prompt. 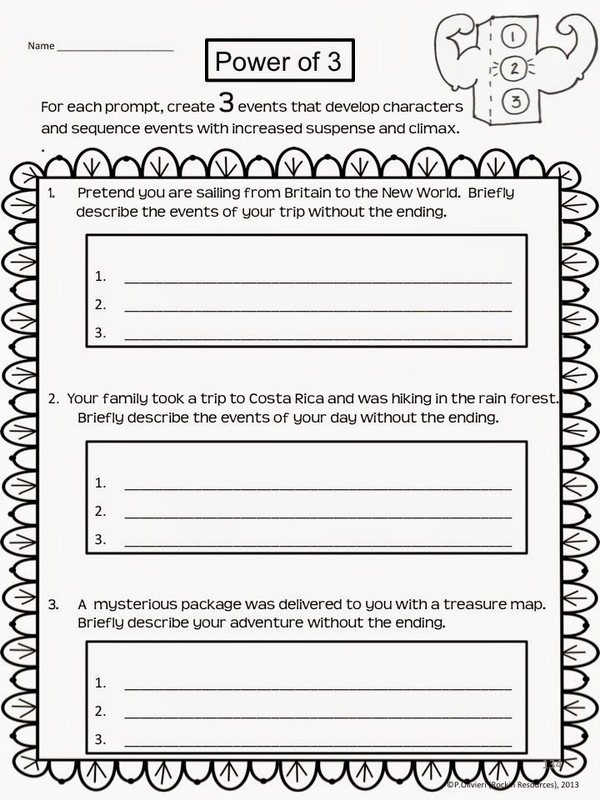 Add topic sentences and details for 3 events in the story. Sharing is a valuable activity. Students gain ideas from each other and may want to go back and make some changes in their own writing. I hope you now have ideas to teach students how to develop a strong body for their narrative stories! NEXT LESSON: WRITING MINI LESSON #18- BUILDING SUSPENSE AND CLIMAX IN A NARRATIVE ESSAY!